HARD MASS is a bulk formula dedicated to slow metabolizers. 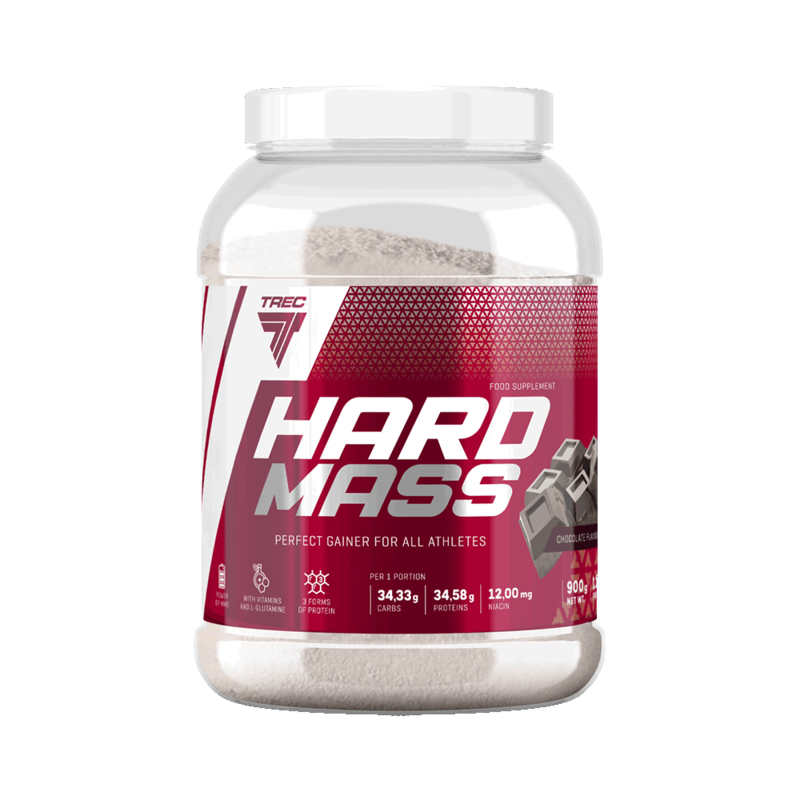 HARD MASS is an optimum combination of full value animal proteins and complex carbohydrates, enhanced with a large amount of L-glutamine peptide and HMB. HARD MASS contains proteins, which contributes to the growth and maintenance of muscle mass. HARD MASS is additionally fortified with a complex which promotes supplementation of vitamins in your daily diet. Recommended daily portion is 150 g.
Dissolve one portion of the product – 75 g (3,5 scoops) in 200 ml of water or milk; use a shaker or a blender. Take 2 servings daily. On workout days: 1st serving 60 min. before workout, 2nd serving 30 min. after workout. On non-workout days: 1st serving in the morning after getting up, 2nd serving between meals. INGREDIENTS: HARD PROTEIN Blend [whey protein concentrate (from milk); egg protein; calcium caseinate (from milk)]; MASSIVE CARB Matrix [maltodextrins; modified starch (from barley); fructose]; MUSCLE-PRO Formula [L-glutamine peptide (from wheat); calcium beta-hydroxy beta-methylbutyrate]; cacao powder for the chocolate flavour; flavourings; vitamin complex [vit. C (L-ascorbic acid); niacin (nicotinamide); vit. E (DL-alpha-tocopheryl acetate); pantothenic acid (calcium D-pantothenate); vit. B6 (pyridoxine hydrochloride); riboflavin; thiamine (thiamin mononitrate); folic acid (pteroylmonoglutamic acid); biotin (D-biotin); vit. B12 (cyanocobalamin)]; sweeteners – sodium cyclamate, sodium saccharin; colour for the vanilla flavour – beta-carotene.